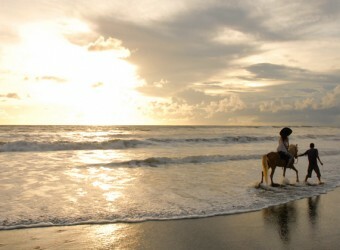 Bali Activity Sunset horse riding is available now in the Western Nyani beac! It starts from a restaurant in Nyani Village and go through the beautiful Balinese nature places such as rice terraces to the beach by horse. After 20 minutes of the riding, you will see and be amazed at the beautifulness of the secret beach tourists rarely visit. Make it a memorial experience in the life time! . More detail Super reasonable Sunset Horse Riding 4in 1 Package. ・There are a reception, a pool, a toilet and a horse riding area. ・There is no changing rooms, so please use the restroom to change. ・After getting ready for the horse riding, going to the area back of the restaurant. ・Enjoy the beautiful sunset which only locals know! ★Please let us know which menu you want when booking. + Spa Package　※The horse ride held before sunset time. Start the tour 2 hours earlier! after the horse riding, going to Tanah Lot Temply with Agus transport to enjoy visiting the temple and sunset! Seafood dinner and Kechak dance are also included in the course! Please let us know your prefered time for horse riding in the day time. The rate = ￥100 = Rp. 10,000. ex) If you pay ＄100 for the price ＄96, the change will be Rp. 4,000 (＄4). ※Please note that he picking-up time and schedule time are often changed. We recommend considerate other plan if you not agree with this notice. It was my first time enjoy horse ride in Bali. I was a little scared, but I was okay because escorted by a professional guide. It was nice to ride on the back on a horse. I could not watch the sunset clearly on this day but I got many good memories. At first I felt anxious about many things but after I got instructions from the instructor, I could enjoy much the ride. I could enjoy the beautiful sunset of my dream, nothing I can say! !